IO Earth is a band from the United Kingdom. They have made three albums to date, namely IO Earth from 2009 (see review), Moments from 2012 (see review) and New World from 2015 (see review). As you can read in the previous reviews, colleague Henri Strik was particularly charmed by all albums, where he made the comment that New World is the most beautiful album the band has made so far. I have been following this band for years too and I do agree with Henri that New World is a peerless album that I still play regularly and that still moves me. 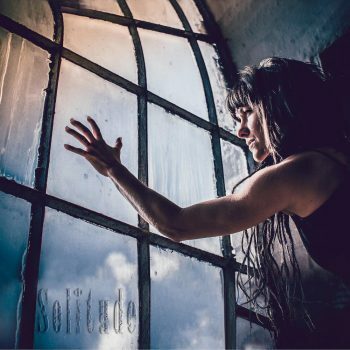 I had the permission of Henri to write the review of the new album Solitude. It makes me very happy to do this, because who would not want to write a review of such a fantastic band? For the third time in the history of IO Earth, they have a new singer at this album. This time it is Rosanna Lefevre who is also from the United Kingdom. She replaces Linda Odinsen, who did a fantastic job on New World. Besides Rosanna the band consists of long serving members Adam Gough (keyboards & programming, acoustic guitar, vocals & narrations) and Dave Cureton (guitars, vocals, keyboards & programming), and still has Christian Nokes (bass guitar), Luke Shingler (tenor & soprano saxophone, flute & EWI), Jez King (violin) and Christian Jerromes (drums & percussion). The additional musicians are Neve King (vocals), Wendy Vissers-Hagenbeek (narrations), Steve Trigg (trumpet & flugelhorn), Jennie Appleyard (cello) and Miguel Seco (keyboards & programming), a whole arsenal of artists as you can read. To IO Earth the particularly difficult task and honor to equal their unparalleled album from 2015, New World. Yes, it is true what you read, equal, because it is not possible to create a more beautiful album than New World. Sorry for my statement, maybe I do disappoint you, but it is the truth. More beautiful, or better if you want to read, is not possible. However, that was my conviction, until recently. Now I have another opinion. For me Solitude is a better, more beautiful album, whether you agree or not. That is, of course, my opinion because I cannot determine for anyone else (however in this case I surely want you to have the same opinion as I have because of the high quality of the album). Recently I said to a friend that I, like Henri experienced at Moments there was not much new on the album compared to the previous one. After I listened to Solitude more intensely, as I do if I am writing a review, I came to a different conclusion, as you can see from the amount of stars I gave the album. For me the difference between New World and Solitude are the more emotional parts of Rosanna in her singing, the depth of the theme of the album and the way Dave is playing his guitar. IO Earth is on full steam on this album, no negative word for one of the contributors, it is all sounding so perfectly, great!!! Which styles can be expected from the album? I hear ethnic music, folk, pop, rock, progressive rock, metal, gothic, jazz and classical music. Now we head over to the music because that is why you are reading this review, of course! Musically, every song is a story in itself, what is pretty good if you ask me. What is striking? As mentioned before there is a special role for newcomer Rosanna, who sings with her velvet voice all over the album, as if she is a real extra instrument, small if it has to be small, overwhelming if it is needed, and trust me, that is needed a lot of times. The overall theme of the album is the solitude that we can experience and all the emotions compared herewith. Emotion is another theme of the album. You can experience that in all tracks, all instruments, all sung passages, even in the booklet of the disc, as well as the front cover of the case. For me it is a gem!! In the song Strangest Ways In Life there are many threatening moments, it almost frightens you, especially if you read the lyrics. If in one song the music is in harmony with the lyrics, than it is in this particular song, goosebumps all over your body, and than we did not speak about the guitar solo that almost takes two minutes at the end of the song. We already knew Dave can play his guitar, but that he could sound this emotional, I could have never dreamt of. The song ends bombastically and you automatically stand up and give an ovation while you wipe the tears from your cheeks. Then it is time for Madness, and madness you will hear. In this song a lot is happening and the term orchestral does this honor, you can hear many instruments as described above. Once again Dave claims the lead in playing beautiful solos at his guitar. In Hold On is again a key role for the various types of emotion that Rosanna puts in her voice, as well as the heartrending guitar solo of Dave. In Breakdown you can feel so much subcutaneous aggression, it is not possible to ignore that. Now and then you find out that you are headbanging firmly to blow off steam, what a violence you taste. This is such an outstanding moment at the album, wow. During Race Against Time, in which Dave sings beautifully emotionally and also performs a splitting guitar solo that is magnificently supported by a super tight rhythm section of the both Christian's, you get the need to maximize the volume and pray that the music will continue for at least 100 years, so deeply it affects your soul. Also at the closing track, Find A Way, you will hear a guitar solo that carries you, cares you and heals you. You feel safe with this solo and you also know that it protects you for the rest of your life. If Rosanna sings I'm by your side, you know that it is good and you'll stay behind speechless, stunned, emotionally and surely stripped of all the emotions, wondering if you can ever feel your own solitude again, if you know that IO Earth embraces you, surrounds you and never let you go again!!!! !